One day, a hero searching the wilderness (for a meal in a drought? for her missing sister?) stumbles upon a mysterious blue-haired boy. This boy is alien in two ways: he is stark naked and he is completely human. 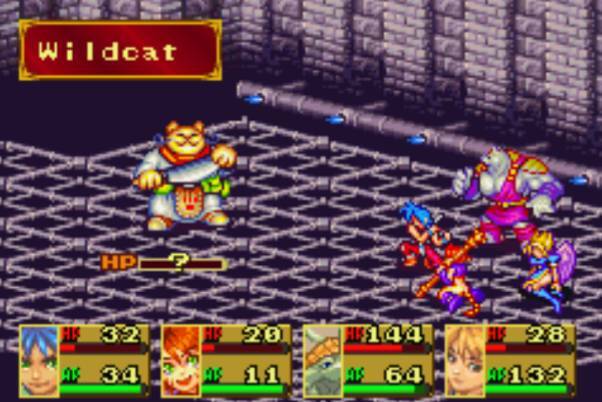 The opening scenes of Breath of Fire III and Breath of Fire IV both feature a scene where the player character, Ryu, is discovered by a party member under these circumstances. And while not every game in the series opens this way, in every game, Ryu is both a figure of otherworldly power and one of the rare characters without any animal characteristic marking his body. These games are set in worlds where most people are characterized by some animal feature. Nina, the series’ other recurring character, always has bird wings; Katt, Rei, Cray and Lin all have tiger tails and ears; Bo and Scias are tall anthropomorphic dogs. The world is inhabited by animal-human hybrids, of which Ryu is unusual in being totally human. And yet, each game stresses his alienation because he lacks the animal-human dynamic that the series otherwise normalizes. The Breath of Fire series has always been a solid if underlooked JRPG series that demonstrates much of the most interesting qualities of the genre. However, it’s drama has generally placed much more emphasis on Japanese epic tropes than the globalism found in Final Fantasy—specifically, with regard to animals. The world of Breath of Fire (which, like the Wild ARMS or Phantasy Star series, takes place in the same place at different points in history), is populated by different clans descending from a different god and are marked by certain animal traits. While there are regular people, most are anthropomorphic frogs, fish, moles, monkeys or any other of a long list of animals. The series does not personify animals so much as it disintegrates the boundary between animal and human. This has a notably different interpretive effect than the kind of associations between animals and humans often found in horror, fantasy or folk stories. What we see in English-speaking culture is a need to domesticate the “animal side” in contrast to a Japanese envelopment of the animal into the human (Ortabasi, Melek. “(Re)animating Folklore Raccoon Dogs, Foxes, and Other Supernatural Japanese Citizens in Takahata Isao’s Heisei tanuki gassen Pompoko.” Marvels and Tales 27.2 (2013): 254-275.). Obviously this is not universal, The Chronicles of Narnia offer a noble vision of personified animals and the animism found in English language African literature is markedly different from, say, the symbolic threat a deer poses in Children of Men when it more lazily wanders into the city to “take it back for nature” or the confrontation between human and beast in King Kong, Planet of the Apes or Peter Pan. The children who negotiate with dogs and rabbits in K. Sello Duiker’s The Hidden Star suggests a completely different relationship to animals. Similarly the animal companions in Lauren Beukes’s phenomenal cyberpunk fantasy Zoo City, in which people like the protagonist become fastened to an animal familiar after committing a sin, earning a magic power at the cost of being pulled to pieces and dragged to hell moments if the animal dies or becomes separated from them. I’m not trying to over generalize, only illustrate that texts are capable of framing animal-human hybridity and relationships in a way unlike, say, The Jungle Book, where animals are a proxy for colonized peoples who must be watched and cared for by the human protagonist. In fact, it is this domineering, owner-pet relationship that Breath of Fire seems to deliberately break across the series. In the Breath of Fire series, Ryu is deified and dehumanized because he’s not clearly an animal. It’s Ryu who’s typically found naked in the woods, it’s Ryu whom the party fears will lose control in Breath of Fire IV or whose power alone excites the fear of God in Breath of Fire III. It’s the lack of animal qualities that leave him incomplete. What we see is not just the breakdown between animal and human, but that the animal—in the case of the main characters anyway—is natural to human existence. To clarify, it isn’t that the series portrays the animal people as more ethical or as better people—Balio and Sundar in the third iteration in the series are greedy mobster minotaurs and the fox-tailed Yuna in the fourth performs hideous war crimes—only that they are framed as more natural to the world. It’s the deified characters in completely human bodies that are dangerous because they seek to domesticate the people around them. Like many JRPGs, each game pits the cast against a divine power that aims to control people, with Ryu occupying the silent-protagonist foil for the villain (Auxier, Tom. “Your God is called what? : Breath of Fire II and Religion.” Nightmare Mode. Dec 9 2011.). Particularly, as a game that illustrates mechanics based on intersubjective coordination (Filipowich, Mark. “Plural Protagonism Part 1: Breath of Fire IV.” bigtallwords. Apr 2 2013. ), it’s telling that only the main character and the villain of each game who are without animal traits. Perhaps unsurprisingly, the more human deities—Myria’s recurring role as the possessive matron god and Fou-Lu in the fourth as the cynical other half of Ryu—possess an unnatural capacity for destruction that these games compel the player to resist. Similarly, the character Deis joins the player’s party in the first game, only to return as a smug and indifferent goddess in later games. However, in the first game, when Deis is an active adventurer committed to saving the world, she is a Nāga, a woman with the lower half of a serpent, whereas in her later, passive roles she is fully human. The games frame a more powerful, totally human enemy in the role of a master trying to make pets of its subjects and even though the genre’s suspicion with monotheist deities is well documented, the added layer of animal and animism complicates the narrative in Breath of Fire. Like the anime and manga traditions the series is clearly inspired by, the animal-human hybrids are not any more or less good or whole than people, but they are at constant risk of subjugation by a higher power looking to make pets out of the people in the world. Breath of Fire‘s people are constantly falling into subjectivity and breaking out of it. The player’s Ryu doesn’t belong until he becomes a contrary figure to the main villain; he behaves more like the animals around him than the god he physically resembles. But the animal people never go away. Even at each game’s outset, when the villain has made pets of everyone, neither side seeks to destroy or change the animal side of the people in the world. People are categorically more human, for better or worse, when they are animal-shaped. In spite of the technologies they use or the organizations they found, the binary between animal and human remains collapsed and their association with the animal world is naturalized and made permanent. These games suggest that it is the total victory of humanity that poses the greatest threat to people. The stress of those human qualities—reason, patience, love—that drive the villain’s interest in subjugating the world’s peoples. That suggestion flies in the face of the typical horror-based narrative of animal hybridity that privileges humanity and offers an alternative reading where animals and humans are one and that establishing that binary proffers conflict. Further reading: Lemke, Harrison. “Earthbound and the Virtuous Uses of Nostalgia.” Game Church. May 13 2014. Alexandra, Heather. “Perspectives on the Gods of Dragon Age: Inquisition.” Transgamer Thoughts. Dec 12 2014. Allison, Christopher. “Four things to understand before playing JRPGs.” Tech in Asia. Jan 10 2014. Saeedy, Alexander. “The JRPG May be Exactly What Gaming Needs.” Kill Screen. Aug 23 2013. Sou Brasileiro muito fã deste jogo, não tinha olhado nesse ponto de vista, esse texto me ensinou muito!!! Thank youuuuu!!! !